Whether you're playing cards or eating dinner, the ALPS Mountaineering dining table is sure to be a hit! On your next outing, take one of these tables along and make your event even more enjoyable. This easy-to-use folding table is great for camping, backyard barbecues, holiday get-togethers, and tailgating. Whether you&apos;re playing cards or eating dinner, the ALPS Mountaineering dining table is sure to be a hit! On your next outing, take one of these tables along and make your event even more enjoyable. This easy-to-use folding table is great for camping, backyard barbecues, holiday get-togethers, and tailgating. 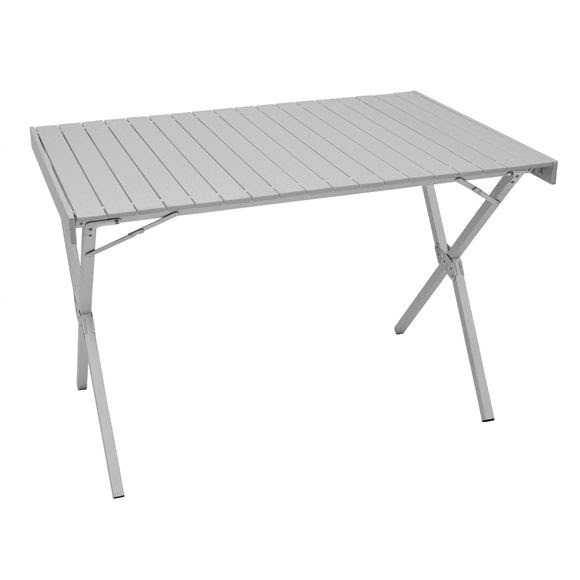 Made with a sturdy aluminum X-frame and fold-up top, the table sets up easily and is designed with no interfering side supports so chairs can move up close. You can comfortably sit up to the table without worrying about hitting your knees on the side supports. When the party&apos;s over, the tabletop and frame collapse quickly and slide easily into a convenient shoulder carry bag for compact storage or transport. As durable, sturdy, and lightweight as this table is, it&apos;s easy to see why it is a top seller!